+ 2. J.H. 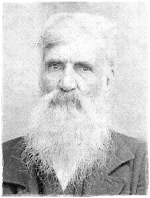 Morrison, Jr.
John was the son of Alexander Morrison and Lucinda Brewer. Nannie was the daughter of George W. Williams and Sarah Catherine Wallace.